It may seem early but, ticks are active and questing for a host at temperatures above four degrees. They are currently emerging from leafy piles and brush areas as the snow melts. 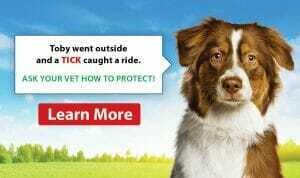 Ticks will hitch onto anything that passes by including people, dogs, cats and wildlife. The incidence rate of ticks and tick-borne disease is on the rise in southern Ontario. According to Toronto Public Health reports, ticks are now endemic throughout all the southern Ontario regions including the east, west and central zones. Remember, it is less traumatic for your pet, and less expensive to prevent tick-borne diseases than to treat them after the fact. We have both oral and topical forms of flea and tick prevention and treatment for your pets. One simple dose of prevention given every three months is super convenient and effective. Alternatively, if you prefer, we also have products that can be applied monthly. Please be on the look-out for tick hitchhikers this spring and call us if you find any on your dog. Check family members for ticks after walking in wooded or grassy areas carefully. Tick nymphs can be as tiny as a pinhead and difficult to spot. This makes prevention all the more important. Give us a call at 416.537.3128 or send us an email at clientcare@annexvet.ca to book an appointment.